Last year The Naturals caught my interest. I loved the Criminal Minds vibe but didn’t care for the cliché love triangle between Cassie, Dean, and Michael and with this sequel not much has changed. I still liked the Criminal Minds esque storyline and didn’t care for the love interests. 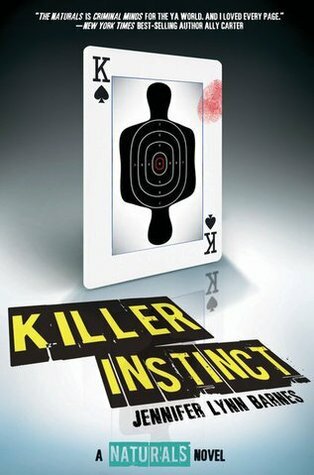 Killer Instinct begins a few months after The Naturals and because of everything that happened the group of FBI teams is relegated to unsolved cold cases rather than active files. They are understandably bored and so when a case falls in to their laps they band together to solve it. I liked that in this book we got to know each of the characters a little better. The story though really focused on Dean and his relationship with his father and what growing up was like for him. I enjoyed learning about Dean’s past but it also felt like it took a while for the story to get going. It took me a while to get back in to the swing of the characters and the dynamics between them. The love triangle which I vaguely remembered from The Naturals as existing became downright annoying in this novel. I just didn’t feel like Cassie truly cared about either boy and I would have rather had no romance then a bad romance. Overall, Killer Instinct was a middle of the road sequel. I enjoyed the first book but it wasn’t as memorable as The Naturals and I really struggled not to roll my eyes with the love triangle. Too bad the love triangle ruined the book for you! I actually really enjoyed it and thought the mystery aspect was better than ever. However I do think the love triangle was much more annoying in this one. I hope there's a sequel cause I wanna know so much more about the other naturals. Great revuew!